we offer a variety of effective GUTTER GUARDS to meet your needs and budget! So, which Gutter Guard is best? In our experience installing gutter guards in Issaquah and the Seattle – Bellevue area since 2006, we rate GUTTERGLOVE PRO as arguably the best. Why? Gutterglove Pro will keep out fir needles, seed pods, leaves and debris out of your gutters. Only dust and pollen can get in. Gutterglove Pro eliminates the need for interior gutter cleaning, saving you risk of liability exposure and gutter cleaning expenses. It has a downward and outward slope allowing debris to shed more easily that the more common flat ledge guards. Gutterglove Pro can be maintained safely and quickly from the ground when needed, using the quality extension pole and brush which we make available. Gutterglove Pro is Class A fire compliant (Wildfire considerations for those near greenbelts and drier climates). Gutterglove Pro is made in the U.S.A. Keeps you on the ground – away from danger and gutter muck. Reduce you home maintenance costs. Protects your home from water damage caused by clogged gutters. Greatly extends the life of your gutters. 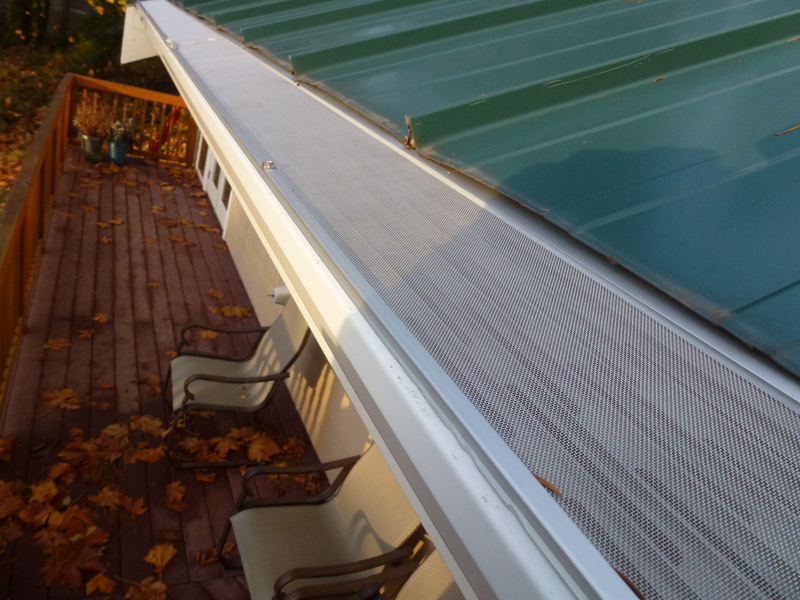 All About Gutters has found that high quality 316L surgical stainless mesh rain filtrations systems keep all debris out of the gutters–Great for leaf filters and gutter guards in Issaquah and the Seattle – Bellevue area. If too small, algae may eventually accumulate. This algae will reduce filtration rates and make if difficult to maintain. If too large, fir needles and smaller debris will fall through. The Company that You Choose. A fantastic product that is installed incorrectly through ignorance or indifference may result in poor performance. Gutter guard company owners in the local area are known to go with a brand for a number or years, close shop when they get call backs from unhappy customers, and open up with another brand – leaving their customers in a lurch. Go with a company that has had the same owner for 7-8 + years, and that doesn’t do high pressure sales. Matching your purchase to your needs. Different sized gutters may require a different sized Gutterglove. Surface area of roof facets are a consideration. Maybe you only want gutter guards for your upper gutters. Maybe you have long upper run of gutter that has only one downspout because there is no good place to add a second downspout and you want to make sure the water flow to downspout is not blocked. Perhaps you will be harvesting rainwater, or want all metal Gutterglove for wildfire considerations. There are many scenarios. Our staff will listen to your concerns and give recommendations. Cleaning rain gutters is dangerous! We have several Bellevue area customers who have lost loved ones and those who live with disability and pain as a result of falls while gutter cleaning. Many homeowners install readily available leaf guards in Seattle only to realize that over time these covers fail to keep leaves and debris out of their gutters and downspouts. Careful research is necessary as there are many leaf guards in the market. Our staff is familiar with most brands and can give you good compare / contrast information. Feel free to contact us today.